In this new series we reveal little known facts about Italian food traditions. 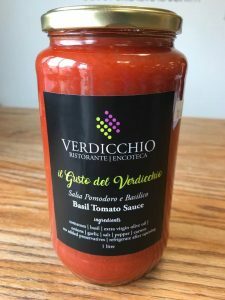 Join us as we plunge into the history of tomato sauce and talk to Heather Pollock about making our salsa pomodoro e basilico. Tomato sauces like Bolognese, pomodoro and puttanesca have become synonymous with Italian cuisine. But, did you know Italians were the last ones to incorporate tomatoes into their diet? Although food historians can trace the origin of pasta back to the early Romans and Greeks, tomatoes and sauce played no part of it. Instead, long flat noodles were rolled out and then dried out in the sun, then layered with different spices of the day. If you haven’t guessed already, it was lasagna. But the addition of tomato sauce likely didn’t come until the 1880s. In fact, the first recipe for pasta with tomato sauce appeared in a French cookbook from 1797! Tomatoes were consumed by the early Aztecs – around 700 AD – but Europeans weren’t introduced to the fruit until the 16th century. And even then they were reluctant to eat the strange looking fruit, especially richer folk. Those who were well-to-do, ate with flatware made of pewter, which contained lead. The acidity of the tomato caused the lead to leak into the food, causing poisoning and even death. So, those who ate off of plates made of wood – peasants – did not have the same reaction. In Italy, one of the first recorded uses of tomato sauce was in the late 1880s with the invention of pizza in Napoli. 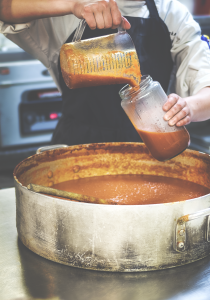 Tomato sauce is a staple in our kitchen. Each week we make at least 40 litres of Basil Tomato Sauce. The sauce is used as a base for recipes involving pasta and pizza and then jarred and sold at My Mother’s Place. Heather advises not to stir the tomato sauce too much! It will add air and slow the process. Next, she opens six large cans of Californian peeled tomato fillets, purees them and pours them into the pan. Then, she adds a whole peeled carrot, cut in half, adds salt and pepper, all the while the sauce begins to simmer. Taste. Add more carrots if the sauce is too acidic. Simmer for more than one hour. Remove carrots. Finally, add whole basil leaves. Buon Appetito!